will quickly improve your Retailing Operations and Business Strategy. The Retail Store Management, Marketing and Merchandising Guide and Checklist is an exceptionally powerful management process whereby an owner or manager of a Retail Store can quickly and efficiently conduct an operational evaluation of their Retail Store. The Retail Store Management, Marketing and Merchandising Guide and Checklist has 979 different tactics, strategies, and action items organized within twenty three (23) different profit-producing modules that focus on all aspects of managing a successful store that range from Store Image to Customer Service to Operations management. The store manager or owner is "walked through" a methodical, step-by-step evaluation process that is quite thorough, provides a careful, thoughtful analysis, and identifies numerous opportunities for improving your store's operations. For ONLY a small investment of $69.95, this Checklist is designed for the serious business owner or manager who truly desires to bring their retail store to the another level of growth, customer satisfaction and store profitability. Type of Store: The Retail Management, Marketing and Merchandising Guide and Checklist will help any type of retail store become more successful - - Antique, Appliance, Bakery, Bike, Book, Boutique, Bridal, Candy, Camera, Clothing, Craft, Curtain, Discount, Fabric, Flower, Furniture, Gallery, Garden Center, Gift, Hardware, Health, Hobby, Home Goods, Jewelry, Lighting, Maternity, Music, Nursery, Pet, Photoshop, Shoe, Specialty, Sports, Toy, Variety, Video, or any other type of retail shopping environment. Owners or Managers of both small and large stores of all types have successfully used this checklist to significantly enhance their operations. And, you can too! 979 different tactics, strategies, and action items to be considered and evaluated - all designed to improve your Store's PROFITABILITY! Twenty three (23) different profit-producing categories ranging from Store Image to Customer Service to Operations management! A step-by-step process to evaluate all aspects of your Store's operations and eliminate inefficient, ineffective processes and procedures! A low-cost investment of ONLY $69.95 with a high-yield ROI. Instant Download after credit card verification! Developed by an experienced Business Consultant who has worked with hundreds of small businesses, many of which were Retail Stores. Developed over a two year period working with Retail Store Owners who tested the Checklist and provided valuable development suggestions. Includes a section entitled Retail Horror Stories describing dozens of actual vignettes of mistakes retail stores of all sizes make that "drive away" good customers. The lessons contained therein are poignant and serve as a guide for "what NOT to do" to your customers! Helps with the financial analysis of your store as it presents several sample Net Income Statements of actual stores. They can be used as a basis for comparing your store's income and expenses. Although each model presents a different set of operational circumstances, they can prove helpful for providing additional insight into your store's current cost structure. Gives you "Peace of Mind" by knowing that you made an intelligent, informed decision to utilize an effective, efficient process that will improve your Store's operations this year! Who Is This For? This Checklist is designed for the serious owner or manager who truly desires to evolve their Retail Store to the next level of growth and profitability. Most of the 979 tactics and strategies can be applied toward any type or size retail store. Some are best utilized with small stores while some are better for larger stores. Some tactics and strategies are free; many have a minimal cost, while a few may require a small investment. Some require only an attitudinal change while others may require a change in a process or a procedure. However, all of the 979 topics merit your thoughtful consideration as you begin to develop a strategy for implementing a "continuous improvement process" for your store. Competitive Advantage: As it is with your store, your competitors are also looking for opportunities where they can find marketing or cost advantages. If you don't take pre-emptive action to improve your business on a regular basis, your competition will leave you behind in the marketplace. Revenue, profitability, and customer satisfaction will then suffer. However, implementing one or two minor improvements based upon the self-assessment checklist could possibly result in 10X, 20X or 100X return on both the time and money you have invested in this process. Make an investment in both yourself and your business by purchasing this checklist, and then conduct the assessment! Your customers will be glad you did. And, when the results show on your bottom line, you will be glad you did also. Based on my Business Consulting Experience! The Retail Management, Marketing and Merchandising Guide and Checklist is based upon my personal experience working with hundreds of small businesses. As a business consultant for both the City of Portsmouth, NH and Somersworth, NH for 8 years, I advised over 500 small business owners, the majority of which were retail stores. Many of these small business owners participated in the two year development process of this checklist by testing it several times and providing valuable, real-world input. Now you can also improve your operations, and, hence, your profitability when you actively apply the tactics contained in this checklist! Income Statements: The Checklist has an addendem entitled Sample Net Income statements containing actual Net Income Statements of several stores. These statements can be used as a basis for comparing your store's income and expenses. Although each financial model presents a different set of operational circumstances, they should prove helpful with providing some insight into your store's current cost structure. Horror Stories: The Checklist has an addendum entitled Retail Horror Stories that illustrates dozens of mistakes that Retail Stores of all sizes make that "drive away" good customers. These events have actually happened and reflect the failings of many retail stores. They happen in many stores and in many towns and cities all over the world. Fortunately, there are poignant lessons that can be learned through the mistakes of others that will serve as a guide for "what not to do" to your customers. Two-for-One: Each of the 23 modules has a simple, but thorough, two-part process. The first part of the assessment process entitled ASSESSMENT will rapidly isolate any problem areas and identify opportunities for quickly improving your operations. This process is thought-provoking and will no doubt stimulate a lot of new ideas for you, or if you have a management team, will generate much discussion among them. The second part entitled IMPLEMENTATION is a management process that will help you prioritize and manage the implementation of any tactic or strategy as well as identify the "action items" that will have the biggest impact on your profitability. Value: Conducting the self-assessment will have an immediate impact on both customer service and profitability. Conducting the self-assessment process on a quarterly or semi-annual basis will help keep you focused on your Store's long-term objectives. Sharing the results of this self-assessment process with your employees and assigning them a specific problem to address can be a valuable training exercise and/or employee development tool. If a number of problems have been identified, it will be important to prioritize your actions based upon the highest and best return that can be achieved for the amount of investment you can make at this time. Additionally, comparing a previous quarter's results with the current quarterly performance will determine the rate of progress you have made in each area. Committing to conducting such an assessment on a regular basis will result in a continual improvement process that in turn will result in a higher level of customer satisfaction and store profitability. You can use this tool to personally conduct an assessment of your retail store. You can assign one of your store managers (or a key employee) the task of conducting the assessment as part of an overall employee development process. You can have a neighboring retail store owner conduct the assessment of your store and, in return, you can conduct an assessment of their store. You can have a Board Member, a Management Advisory Committee Member, or a trusted advisor conduct the assessment. You, or a key employee, can conduct a partial assessment of your store by using one, two, three or more of the major categories in this document to focus specifically on a problem(s) previously identified by yourself, an employee, or a customer. You can utilize an independent consultant to conduct this assessment for you. However, that would defeat the purpose of a self-assessment program. A do-it-yourself process can save you many thousands of dollars in consulting fees, and, the truth is, you could probably conduct a much better evaulation yourself. Once you have identified a problem area(s), you may then want to engage an experienced consultant or specialist on a short-term basis to help with these specific areas. Satisfaction Guaranteed - 100% Risk Free: Still not sure this Checklist will help you and your Retail Store? Well, I want you to feel completely comfortable before you order. Therefore, I would encourage you to continue exploring my website where you will find more information regarding Jaguar Consulting, Inc., our services, testimonials, additional profit-building Business Checklists, White Papers, and other reassuring information. The Retail Store Management, Marketing and Merchandising Guide and Checklist comes with a No-Questions-Asked, No-Hassle, THREE MONTH MONEY BACK GUARANTEE. If you honestly feel that if after applying this Checklist to your retail business it hasn't helped improve your Store's operations, hasn't helped improve efficiency, hasn't saved you time or money, and hasn't made you a more profit oriented Owner or Manager, then just return the Checklist PDF (and all copies) by email anytime within the next 90 days and we will refund the $69.95 you paid (Note: This guarantee applies ONLY to retail store owners or managers and NOT to consultants, students, educators or curiosity seekers). Satisfaction Guaranteed! Quantity Discounts: Volume pricing at substantially reduced discounts off the retail price based on print quantities is available if you have multiple store locations, anticipate frequent usage of the checklists, or are part on an organization that provides goods or services to retail stores and would like to use the checklist as a marketing/business development tool. Additionally, the opportunity to "brand" the Retail Management, Marketing and Merchandising Guide and Checklist with your company's cover page, letter of introduction, and your logo is available. 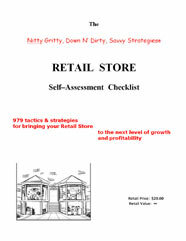 "The retail store checklist helped me put "all" aspects of running a successful business into an easy to read format. It opens your eyes from marketing to merchandising and everything else you could possibly imagine. By referring to it on a regular basis, the checklist has helped make so many improvements in every area of my business!" "Absolutely incredible! The checklist should be a daily read for all retailers." "As an experienced business owner, I thought I had covered all the bases when I opened my new store. After now utilizing the Retail Store Self-Assessment Checklist, I realized how many details I had missed. The checklists are easy to understand and very easy to use. As my store manager said "This makes my job easier and more efficient. The strategies in the checklist help us keep ahead of our competition". "Metalwear uses the Retail Checklist as a training guide for all new employees. It clarifies that which is essential for proper store management." I. A Professional Store Image. 24 Strategies and Tactics to be Evaluated. II. Store Appearance - Exterior. 30 Strategies and Tactics to be Evaluated. III. Store Appearance - Interior. IV. Techniques That Support the Sales and Marketing Process. 29 Strategies and Tactics to be Evaluated. V. Techniques That Make It Easy for Customers To Buy. 50 Strategies and Tactics to be Evaluated. VI. Employee Marketing and Sales Attitudes. 47 Strategies and Tactics to be Evaluated. 42 Strategies and Tactics to be Evaluated. 66 Strategies and Tactics to be Evaluated. 38 Strategies and Tactics to be Evaluated. XI. Strategies That Attract Attention..
27 Strategies and Tactics to be Evaluated. XII. Other Interesting and Profitable Techniques. 46 Strategies and Tactics to be Evaluated. XIII. Internet Marketing Strategies for your Store. 126 Strategies and Tactics to be Evaluated. XIV. How to Compete with the Giants. 56 Strategies and Tactics to be Evaluated. 40 Strategies and Tactics to be Evaluated. 51 Strategies and Tactics to be Evaluated. 48 Strategies and Tactics to be Evaluated. XVIII. "Behind the Scenes" Management. 44 Strategies and Tactics to be Evaluated. 18 Strategies and Tactics to be Evaluated. XXI. Evaluate All Outside Services for Effectiveness. 32 Strategies and Tactics to be Evaluated. 35 Strategies and Tactics to be Evaluated. XXIII. 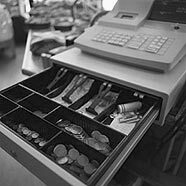 Protecting Your Store's Most Valuable Asset - Yourself. XXIV. Sample Net Income Statements. "The Retail Self-Assessment Checklist was a solid tool to help me get a better focus on all aspects of my business. Particularly helpful was the section dealing with employee policies and issues. I was able to clarify policies, specific and general, through the implementation of an employee manual so that I'm no longer making "off the cuff" decisions. I found the checklist helped me to anticipate questions and problems so they might be addressed early."